If you are intending to visit the Spanish Canary Island of Fuerteventura then you will want to see images and views of the best places to visit during your stay. There are seven islands grouped close to each other off the African coast, known as the Canaries, and Fuerteventura is the second largest. Further down this page we have a list of the various webcams on the island. These web cams are cameras set up in some of the most scenic spots on the island which stream live video footage which you can view 24 hours a day on the Internet. Cams are great for being able to see what the island actually looks like and what the weather conditions are currently. 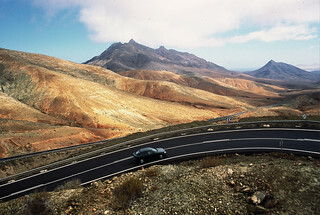 The consistent temperatures and climate are certainly one of the main reasons Fuerteventura is so popular. The island is closer to Africa (97km) than it is Spain. This geographical advantage gives it a far longer tourist season with many visitors arriving in the winter months when the popular Spanish regions of the Costa del Sol or Costa Blanca, are much colder. There are many fabulous beaches on the Canary Islands but the unique attraction of Fuerteventura is the strong Sahara winds which makes it a favourite destination for sports involving water and wind, these include windsurfing and kitesurfing. Indeed the name of Fuerteventura derives from the Spanish words for strong (fuerte) and wind (viento). Windsurfers will want to see webcams from Playa de Sotavento beach between Costa Calma and Morro Jable which is the venue for the world championships. This is the south of the island where the best beaches are especially in the area of Jandia which covers the southern peninsular. At the north of the island is the popular beach resort of Correlejo famous for its sand dunes. The most popular resort is Costa Caleta (also known as Caleta de Fuste). Restaurante Coronado – Jandia Webcam – Set in Jandia this restaurant overlooks a wonderful beach and appears to be set in the Caribbean the waters are so clear. 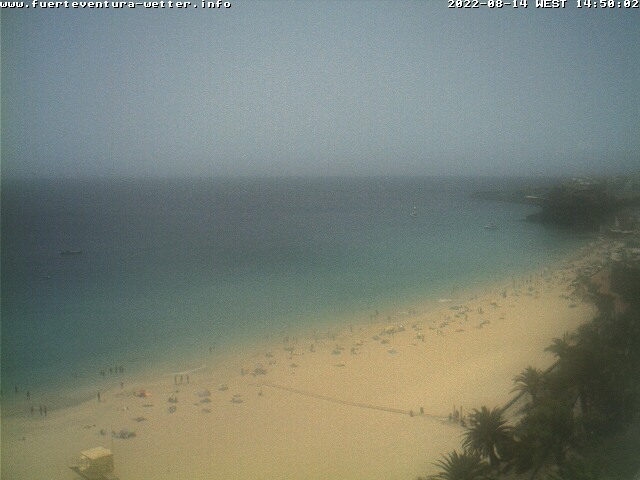 Webcam in Corralejo – Showing a panoramic view of the Corralejo bay and its beach in Fuerteventura. Web Camera is located on the El Campanario Shopping Center tower, one of the most popular place in Fuerteventura Island. The centre’s emblem is his bell tower, which one, being the highest point in Corralejo, offer spectacular views all around the town, and the sandy dunes and beaches of the Corralejo natural park, a major tourist attraction in Fuerteventura. See a live view on its bay, between its harbour and its fantastic large beaches, with Lobos and Lanzarote islands into the background. Webcam of Flag Beach in Corralejo – Showing live pictures of Flag Beach, one of the famous beaches for kitesurfing and windsurfing in Fuerteventura north-east coast. Exposed to the trade winds blowing with regularity in spring and summertime and protected from the open sea swell by Lobos island, Flag Beach offer perfect conditions for beginners and advanced windsurfers or kitesurfers. Page Summary – if you have any interest in visiting the Spanish Canary Island of Fuerteventura, then you will want to see it visually and so above we have provided a list of web cams, videos and photographs.